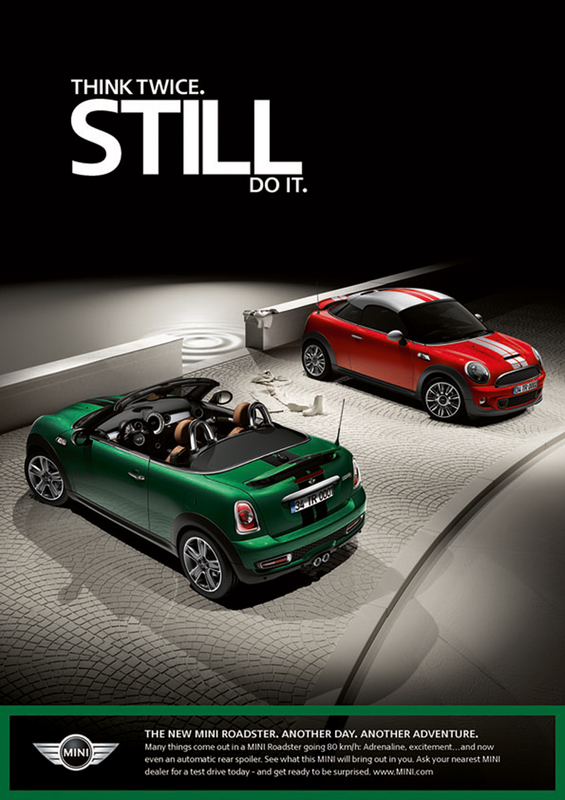 This entry was posted in ads advertising and tagged MINI Coupé MINI Roadster on November 3, 2011 by James Day. Half the Seats TWICE the Fun. Think Twice STILL Do It. From A to B OR NOT to B? Made to CROSS the Line. Get Used to Being FOLLOWED. This entry was posted in ads collectibles and tagged MINI Coupé on October 10, 2011 by James Day. Action packed with a six-speed transmission, MacPherson suspension and a 181-horsepower turbocharged engine, this Cooper S two-seater leaves no room for anyone to tell you to slow down. In fact, when you hit 50 MPH, the rear spoiler automatically raises for better downforce, practically begging you to go even faster. THE NEW MINI COUPE. HOLD ON. 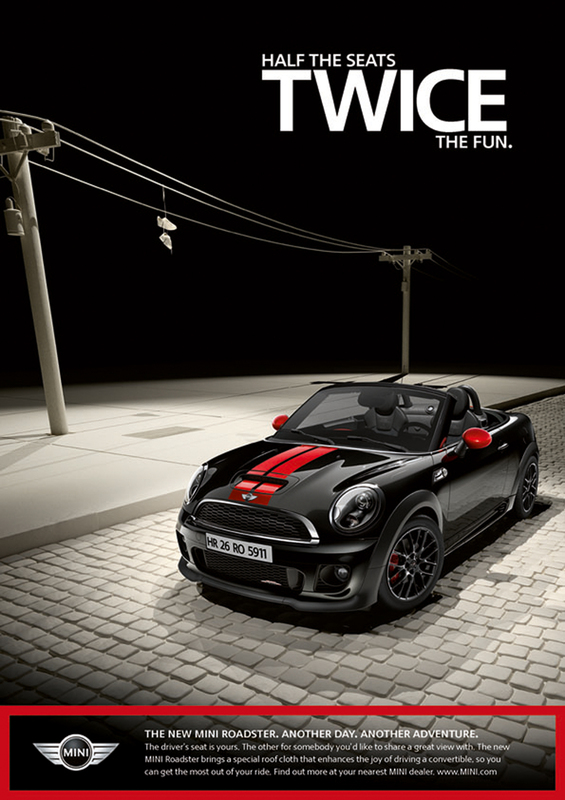 A few days ago we featured the first MINI Coupe print ad for the John Cooper Works Coupe. Here we have one for the MINI Cooper S Coupe shown in Lightning Blue and Silver. This entry was posted in ads collectibles and tagged MINI Coupé on October 6, 2011 by James Day. Action packed with a six-speed manual transmission, MacPherson suspension and a road-devouring 208-horsepower engine, this John Cooper Works two-seater lets you feed your craving for speed. And when you hit 50 MPH, the rear spoiler automatically raises for better downforce, begging you to go even faster in the fastest MINI yet. THE NEW MINI COUPE. HOLD ON. 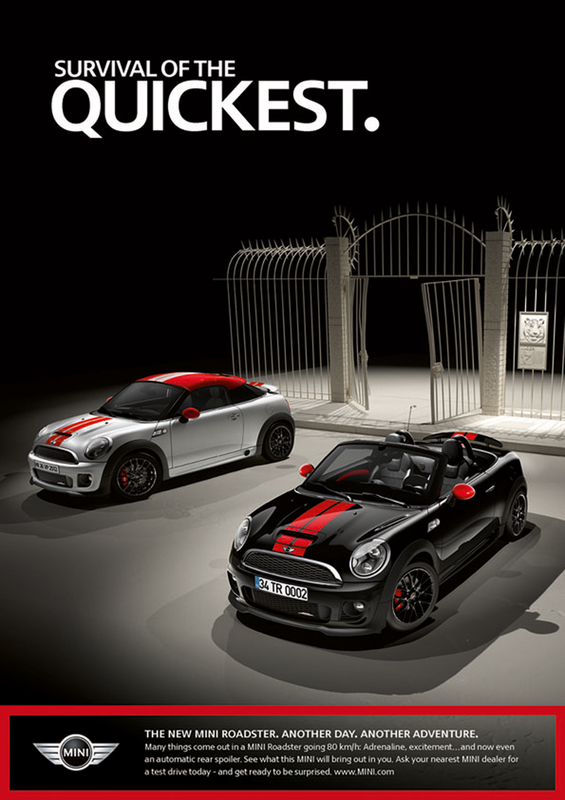 Now that the MINI Coupe is officially on sale, MINI USA has begun its print ad campaign. Expect to find more MINI Coupe ads in November issues of magazines arriving to subscribers now. This entry was posted in ads collectibles and tagged MINI Countryman on March 13, 2011 by James Day. Recently we mentioned the Virtual MINI Countryman app by BSSP. BSSP has created a print ad to promote the app. Introducing the bigger, four-door, all-wheel drive MINI Countryman. Use your iPhone® and the new Virtual MINI app to see how it looks in your driveway, on the edge of an incredible cliff or anywhere else your heart desires. The ad includes a large QR code which, when scanned with your smartphone, takes you to the iTunes App Store. It can be found on page 094 of the March 2011 issue of WIRED. This entry was posted in ads collectibles and tagged MINI Countryman on February 27, 2011 by James Day. The February 28, 2011 issue of The New Yorker contains a series of three column ads for the MINI Countryman. Similar to previous MINI column ads, these ads “intrude” upon the surrounding ads and cartoon. The text of the small ads says simply “MINI COUNTRYMAN. The all-new, bigger MINI.”. They can be found on pages 25, 27, and 29. Read about the placing of these ads at WWD.com. This entry was posted in ads collectibles and tagged BSSP MINI Countryman on February 5, 2011 by James Day. MINI USA’s ad agency Butler, Shine, Stern & Partners has a third MINI Countryman print ad featuring the Countryman’s larger trunk size. Introducing the bigger, four-door, all-wheel drive MINI Countryman. The print ad can be found on page 13 of the March 2011 issue of Car and Driver. PDF Friday: The MINI One-Gallon Challenge. This entry was posted in ads and tagged PDF Friday on February 4, 2011 by James Day. This crossword puzzle ad comes from 2007 and features the increased fuel efficiency of the second-generation MINI Cooper. JUST HOW LONG CAN A GALLON OF GAS LAST? Depends. Seconds if you’re in a rocket ship. Ages if you’re in a MINI, which is the next best thing. So, to simulate this miles-per-gallon miracle, and show just how long it takes to use a gallon of gas when driving a MINI, we commissioned Fred Piscop, editor of the Washington Post Sunday Magazine crossword, to create this puzzle. Unless you’re a word whiz, it should take you about 40 minutes or longer to complete. Good luck. And may your lexicon be lengthy. Download The MINI One-Gallon Challenge. This entry was posted in ads collectibles and tagged BSSP MINI Countryman on February 1, 2011 by James Day. MINI USA’s ad agency Butler, Shine, Stern & Partners has followed up its first US MINI Countryman print ad with this new one featuring a Pure Red MINI Cooper S Countryman ALL4.